UPDATE: This story was originally published on March 25. We're not style chameleons, per se, but we do like to change things up a bit to fit our mood. And, nothing says "spring" like a good soundtrack. So, we've turned to some of our most-loved recording artists for a little fashion inspiration (read: swagger). From the (now obligatory) Jay-Z BK Nets cap to transplant Mr. Bowie's wild metallics, our thank-god-its-not-snowing ensembles and happy-weather albums go together like, well, Elvis and a white jumpsuit. Just, please, leave the singing to the professionals. Classic, current, constant. Jay-Z is always on our playlist, but we've been replaying "I've Made It," "Lost One," and "Beach Chair," lately, and it's getting us psyched to wear our BK fitted hats when they'll actually be shading sun. Fans or not, they're definitely a great accessory to top off a look. 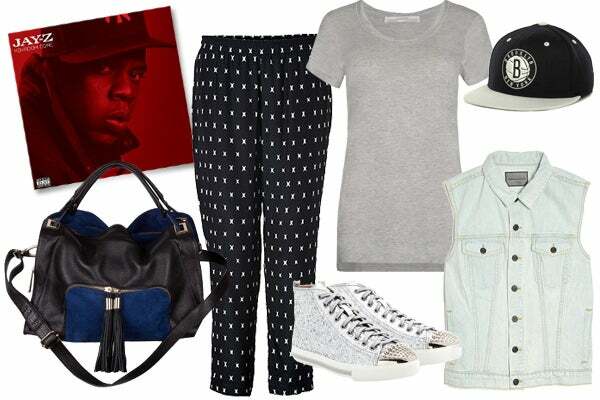 Theory Pants, $230, available at Stylebop; Miu Miu Studded sneakers, $540, available at Net A Porter; Brooklyn Nets Hat; $27.99, available at Lids; Proenza Schouler Denim Vest, $415, available at Kirna Zabete; AllSaints Knox T-shirt $108, available at AllSaints; Sandro Absinthe Bag, $670, available at Sandro . Yes, it was a few summers ago now that we could not stop listening to "Gold Lion." Like, seriously, ever. And we're reviving the raw, rock vibe of this (and every other) Yeah Yeah Yeahs song this spring in anticipation of the band's latest release, set to drop April 16. We pulled inspiration from the album cover (which we love) to create a feminine-edgy outfit to wear on any big (and badass) night out. After all, if you're anything like Karen O, which, uh, you are, you're a "Warrior," too. 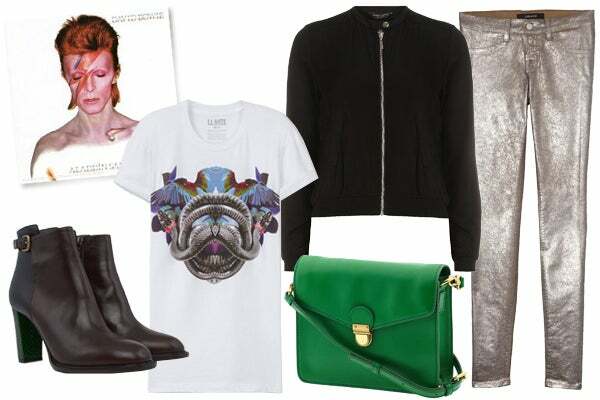 Laurence Dacade Dooney Buckle Bootie, $995, available at Neiman Marcus; Ashley Pintuck Jacket $24.97, available at Tillys; Nali Glitter Clutch With Chain, $28.82, available at ASOS; Kenneth Jay Lane Emerald Drop Earrings, $150, available at Charm&Chain; Alexander Wang Ribbed Dress, $191, available at Lyst. Sneaks on your feet, some Southwestern-print denim on your legs, a little sparkle on your nails, and Avicii in your earbuds are all you need to find a little adventure on any spring day in NYC. Ralph Lauren Denim and Supply Canyon Rock Skinny Jeans, $98, available at Ralph Lauren, Ralph Lauren Denim and Supply Leather Trench Buckle Belt, $35, available at Ralph Lauren, BP Nail Color, $5, available at Nordstrom. Whether it's fashion or music related, Solange is always having a moment. We dig her bold, mix-and-matched prints that still stay sophisticated as well as the colors and vibe of this poppy album cover from one of her older releases. "I Decided" happens to be as of-the-moment as "Losing You" and so is this play suit and blazer combo. Topshop Floral Crop Top And Skirt, $140, available at Topshop; Lover Lunar Blazer, $325, available at Les Nouvelles; Aperlai St.Tropez shoes, $770, available at Feminine Rascal; Forever21 Floral Sunglasses, $5.80, available at Forever21. Sound? Vision? Check and check. Mr. B may be a New Yorker by way of the Atlantic but we still feel like he's a kindred spirit. And, lucky for us, he's coming out with a new album this spring. 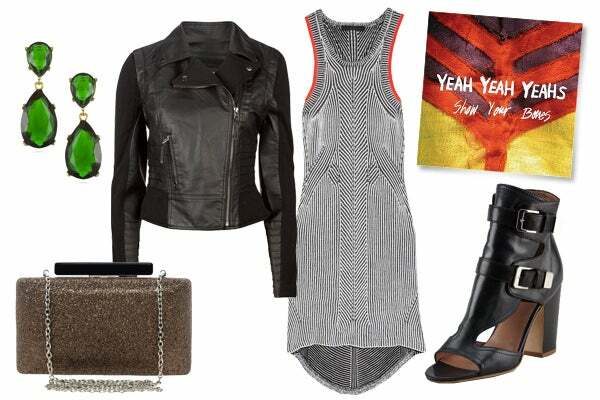 Keep it exciting enough for a Labyrinth party with some metallics, some out-there graphics, and versatile shoes. Dries Van Noten Booties, $725, available at Gravity Pope; J Brand Coated Jeans, $231, available at J Brand; Marc by Marc Jacobs Cross Body Bag, $298, available at Piperlime; La Notte Marcello T-Shirt, $35, available at Aritzia; Dorothy Perkins Black Poly Bomber, $57, available at Dorothy Perkins.